Students, faculty and community members listen in the crowd of the East Lansing Board of Education's March 26 meeting. At this meeting, the board discussed security upgrades. Less than a month after students participated in a national walkout for gun control, East Lansing School District will see new security upgrades. At the elementary schools, an audio and visual buzz-in system was installed in the buildings during spring break, Superintendent Dori Leyko said. The district’s technology department will conduct training for office staff. The district will also work with administrators to plan consistent communication with elementary school families. At the middle school, Leyko said the district has preliminary plans to upgrade the main entrance. But before officials can move forward with that, the district must gather more input from middle school administrators and staff. As for the high school, Leyko said “it’s a whole other ballgame.” A safety and security meeting was held on March 27 to discuss possible upgrades. The March 14 student-led protests in the middle and high school also generated community response. Following the Parkland, Florida, shootings, East Lansing’s school board unanimously approved a resolution opposing guns in schools. 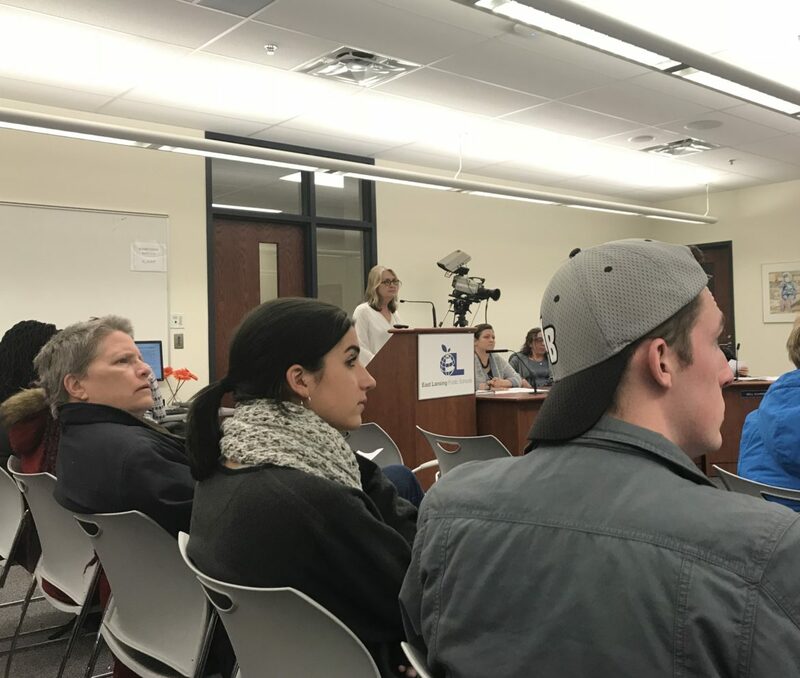 Trustee Nichole Martin, who is a liaison on the Mental Health Advisory Committee, said the East Lansing School District committee wanted to thank the board for its decision. Martin said the middle school walkout had five speeches that focused on school safety, was led by seventh and eighth graders and was very well-organized. Students even painted a banner reading, “you are loved,” that they sent to Parkland. At the high school, students sold shirts, registered to vote and had the option to contact their representatives to express their gun control concerns. Board of Education President Kate Powers also received community input following student gun control efforts. She attended the District Parent Council meeting, where citizens encouraged parents to talk with their children about guns in the home. “There’s a very high percentage of children that are shot and killed by their peers in homes where there are unlocked weapons,” Powers said. Mila Murray is a sophomore journalism student at Michigan State University expecting to graduate in 2020. She works as the student government reporter at The State News and previously covered the State Capitol. She is experienced in Adobe Premiere, videography, Russian as a second language and basic HTML. She aspires to work at a professional newspaper or magazine.